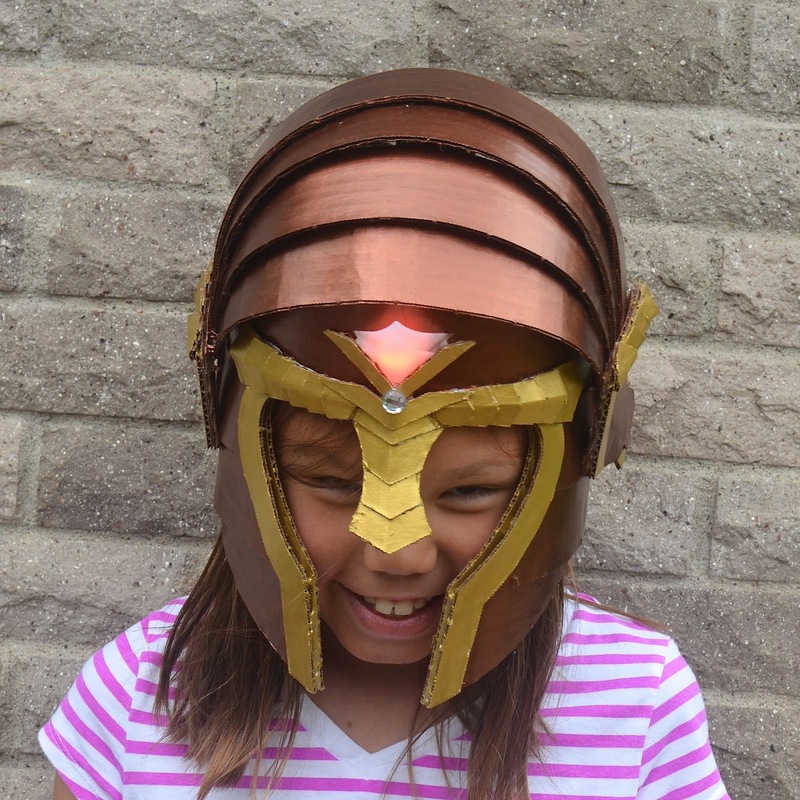 We made a helmet earlier this summer. 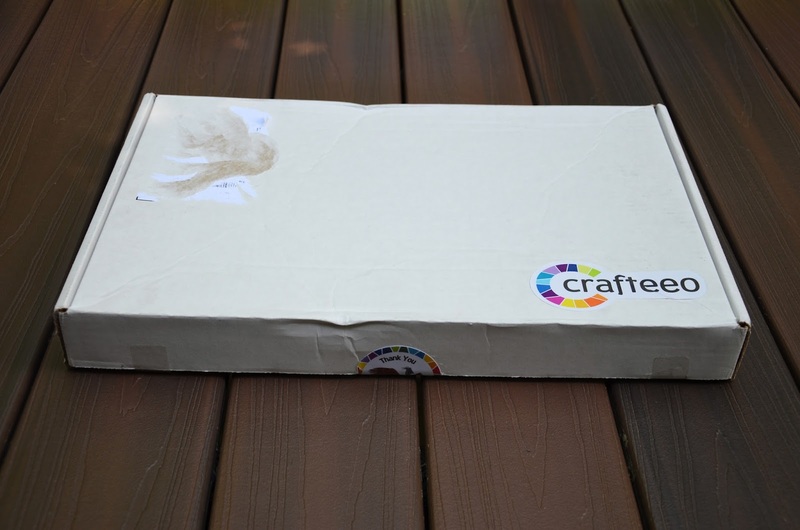 Some months back, Crafteeo sent me their Helmet Kit to try out. The girls and I put it together and in today's post, we're going to tell you all about it. 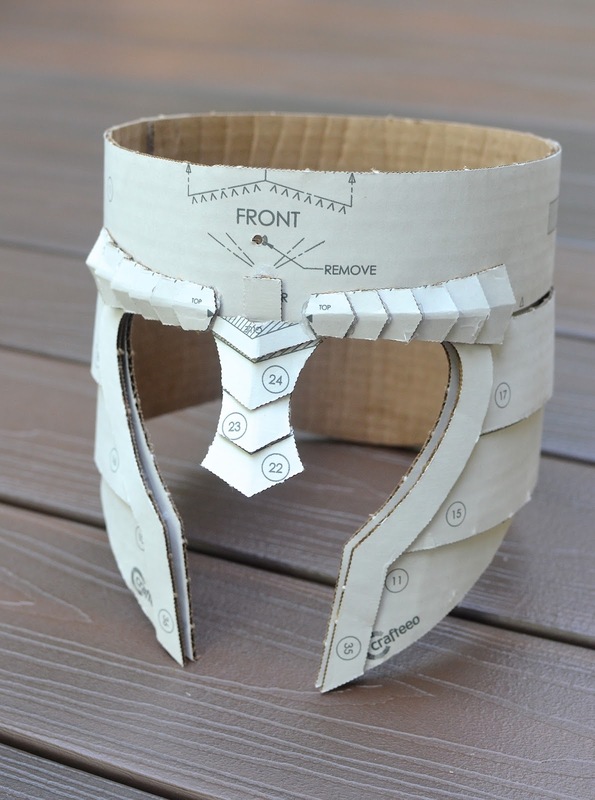 First, this is a cardboard helmet. Like normal-cardboard cardboard. 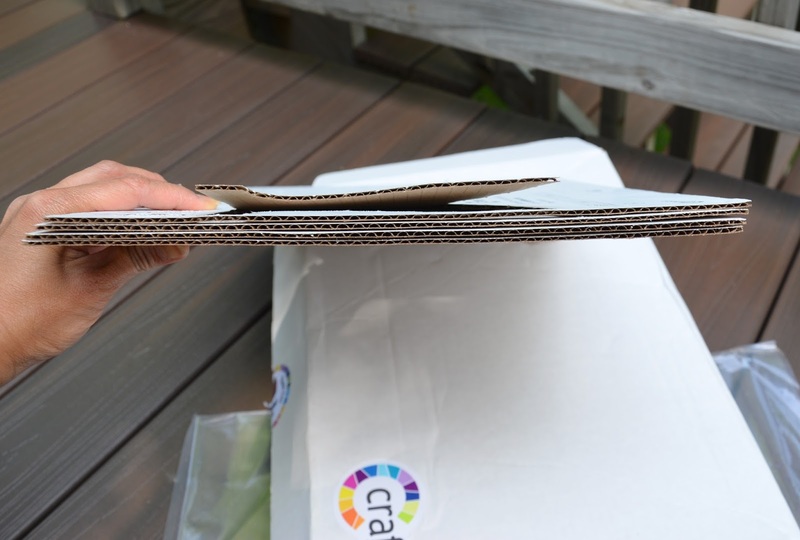 A bit lighter than amazon-shipping boxes kind of normal cardboard. That is the most important thing you need to know (if you don't already) - that cardboard becomes amazing things. Especially cardboard paired with electronics. That was my Helmet Kit overview. Now, on to the background. 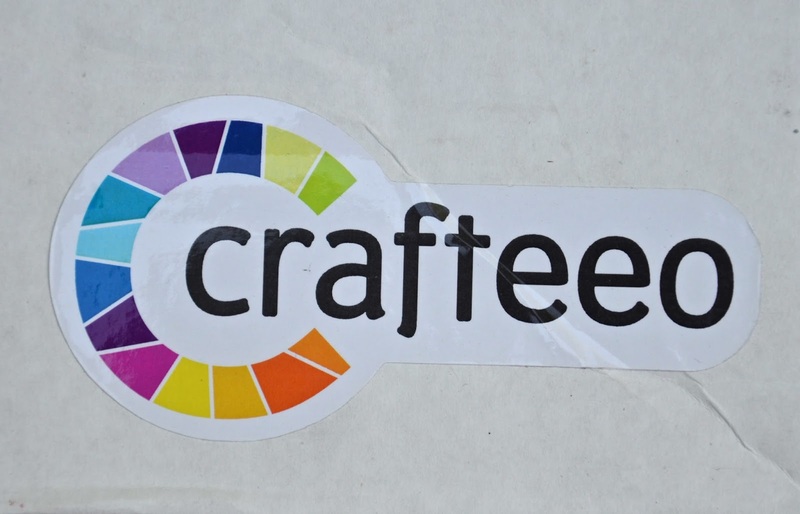 How-Lun Chen, the brainchild behind Crafteeo is a dad who enjoys making things. 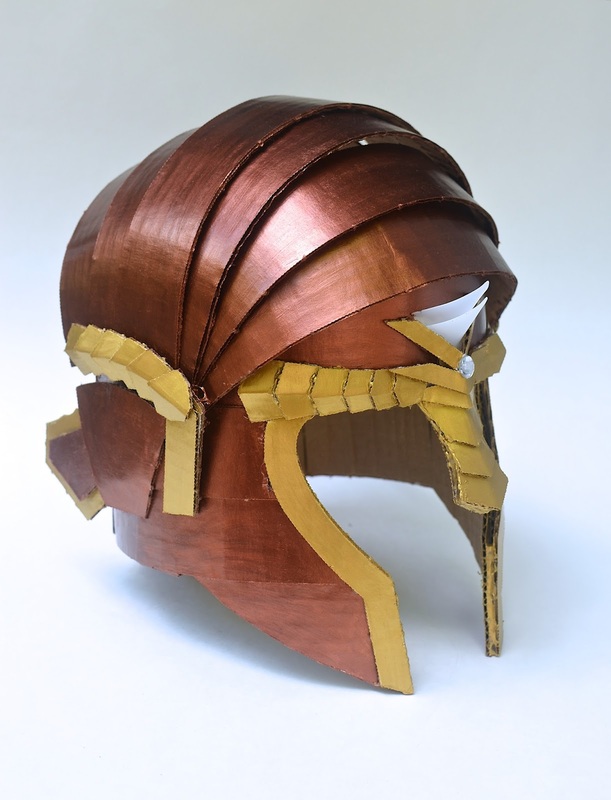 One day, he made a helmet for his son and from that experience, was inspired to develop an entire fantasy world called Aeragos. 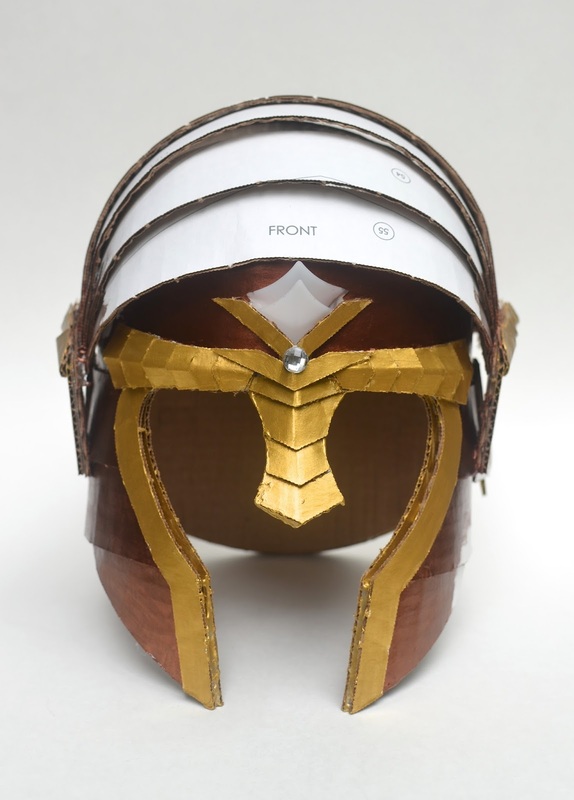 He created helmet kits in two designs and four colorways, one for each of the four Guardian squadrons in his realm, with plans for swords and body armor to come. Our kit arrived in a smashing white cardboard box (which we saved for future crafts). so we could easily punch out all the pieces. 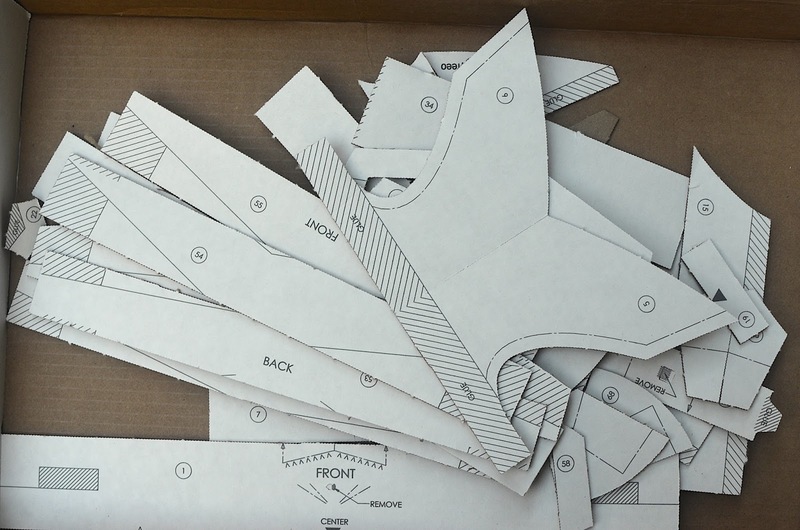 Each piece was numbered, labeled and marked with fold lines and glue areas. 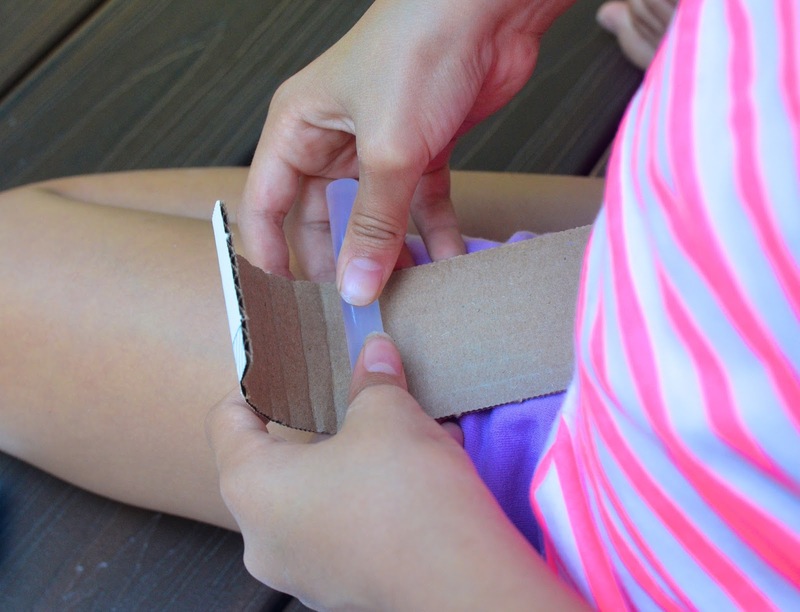 (a pencil was recommended as a form, but we used a hot glue stick because it was convenient). We worked on our kit over a few days because summer was a busy time for us and we were out all day most days. 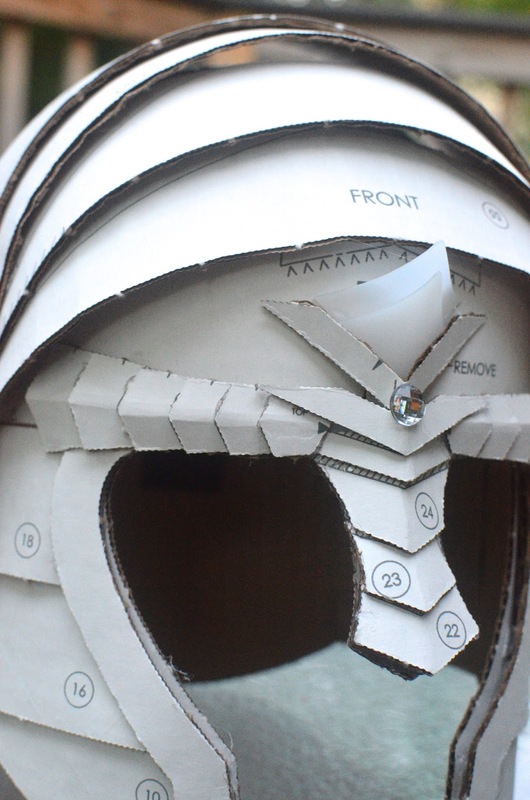 We spent a couple of hours on the first evening punching out, rolling and assembling half the helmet. 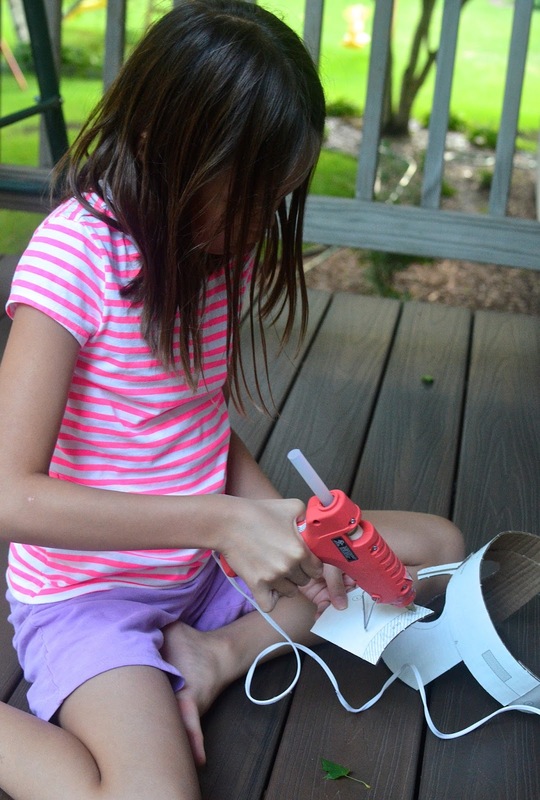 Here is Emily (she's almost 9) with the hot glue gun, assembling the pieces. and the resulting rich three-dimensional features. 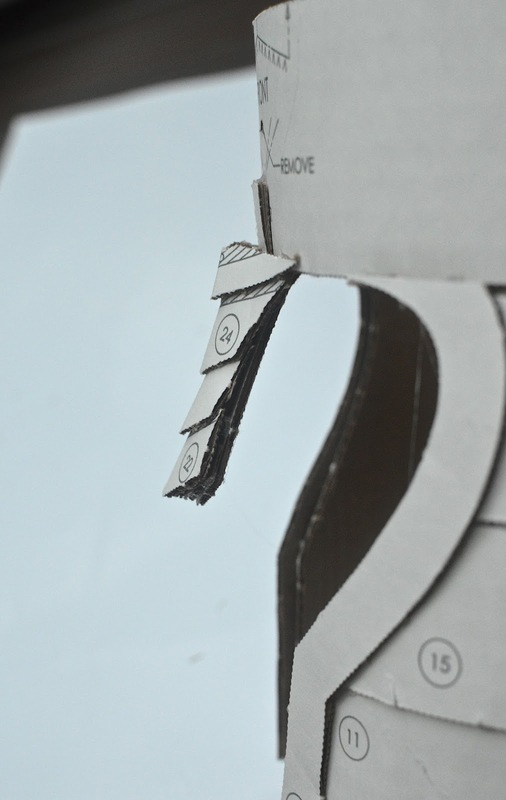 Many of the surfaces were double-layered: the cardboard was thin enough to be pliable, and any areas of possible weakness were reinforced with at least a second layer. You wouldn't believe how strong this nose bridge piece was. 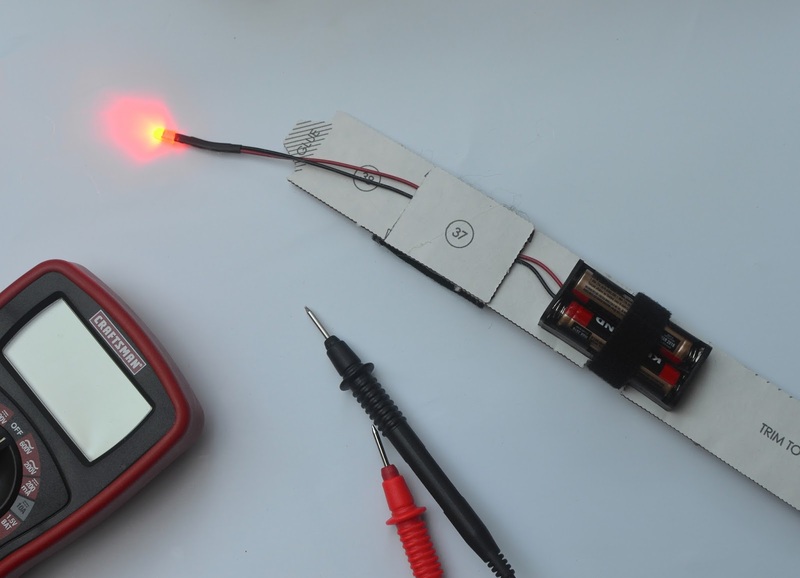 including the installation of the simple electronic circuit that came with the kit. It was preassembled and securely soldered, and only needed batteries. Ignore our multimeter - you won't need it - it's my best friend whenever I'm playing with my circuit stuff, even if it's just to test battery voltages. 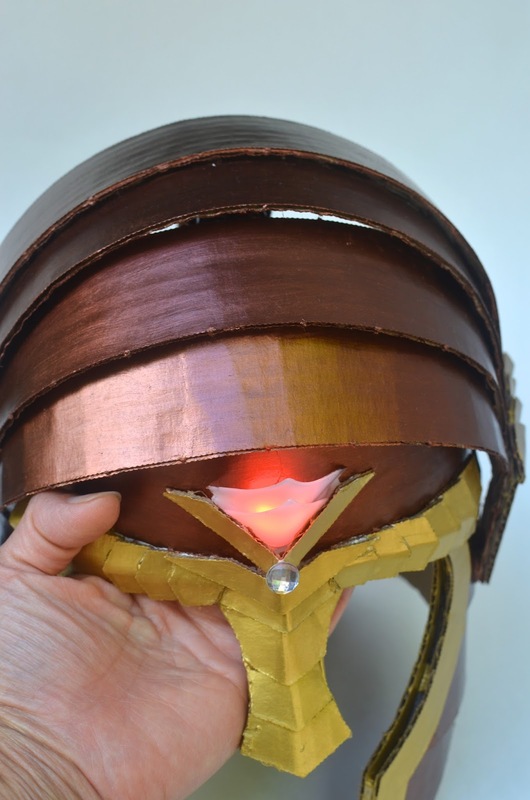 That LED illuminates a decorative piece of plastic in the front of the helmet whenever the helmet is worn, and automatically shuts off when the helmet is removed. My kids loved the effect. We painted the helmet on the third day. The acrylic paints that came with the kit were excellent. I needed only two coats. and let the girls paint the rest. 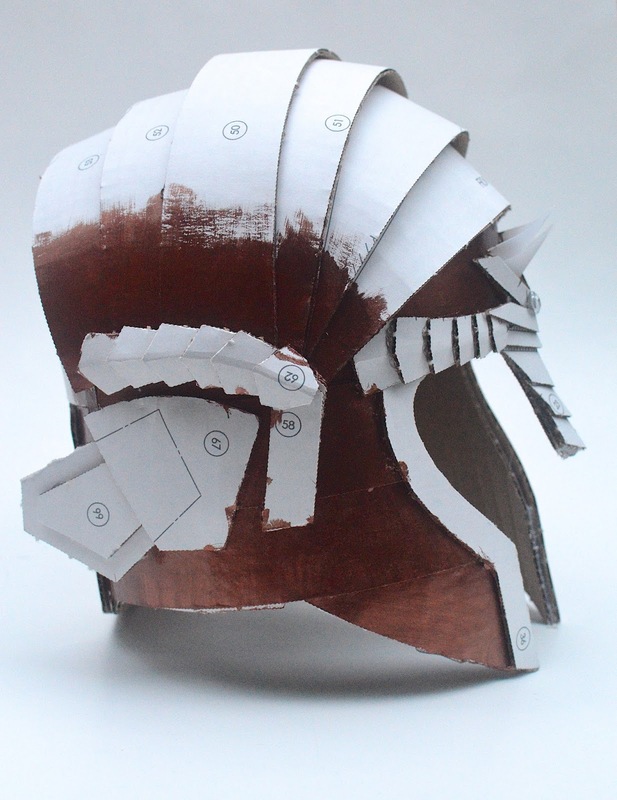 Here are different angles of the finished helmet. 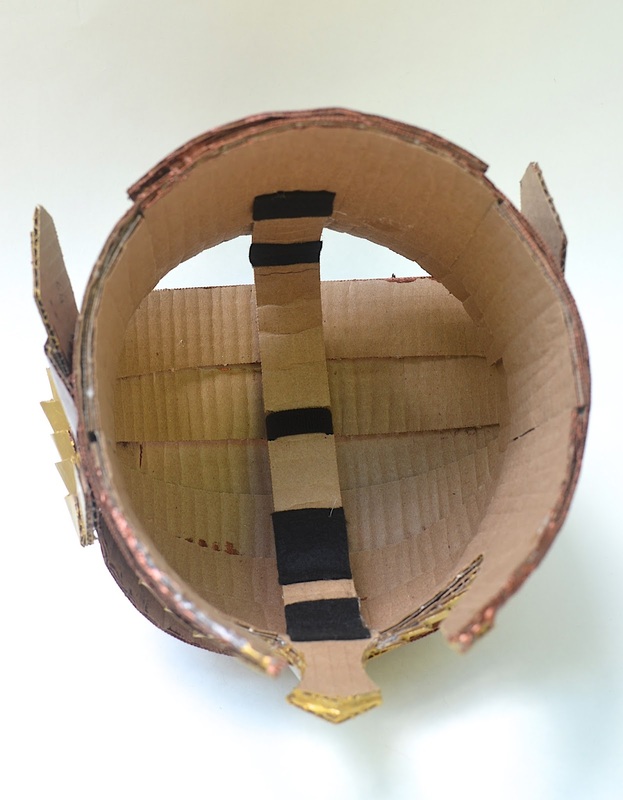 Here is the head strap inside the helmet, with little pieces of felt padding for a comfortable fit and to activate the concealed switch that turns on the LED when worn. This head strap is meant to be adjusted to fit the head of the wearer, which was a little tricky for my family since we have three children between 5 and almost-9 years old. This was one of the more enjoyable craft kits we've had in a while. The girls enjoyed watching it come together, helping to roll the cardboard pieces, painting it after and even gluing some of the bigger pieces on themselves. They also loved the LED thingy (of course). The materials were of impressive quality. 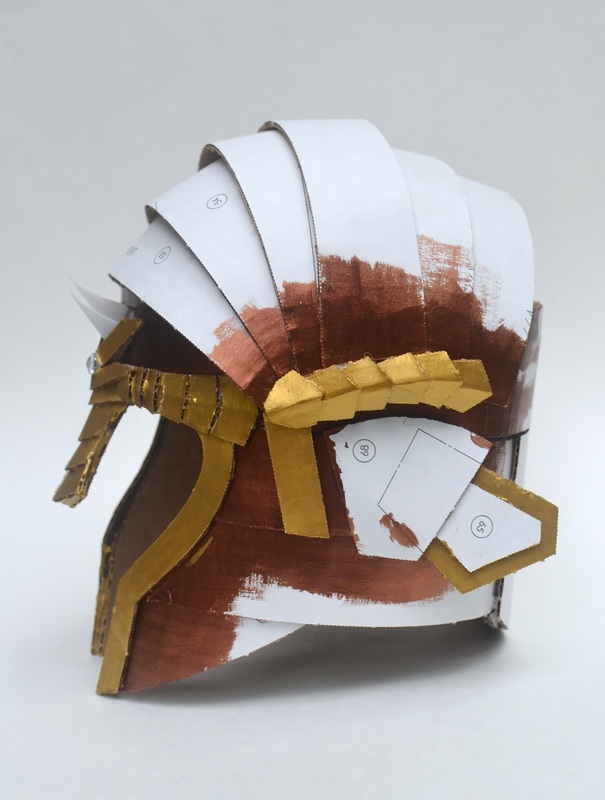 I thought it was very easy to assemble and, because everything was pre-cut, a cinch compared to some of the other cardboard constructions I've made from scratch on my own. 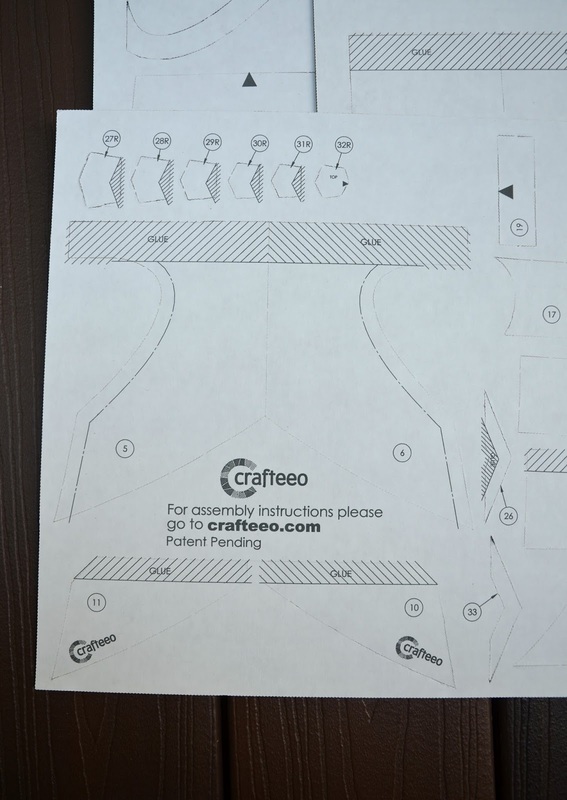 I'm excited that Crafteeo is planning more projects to come: a sword, shield and maybe even body armor. 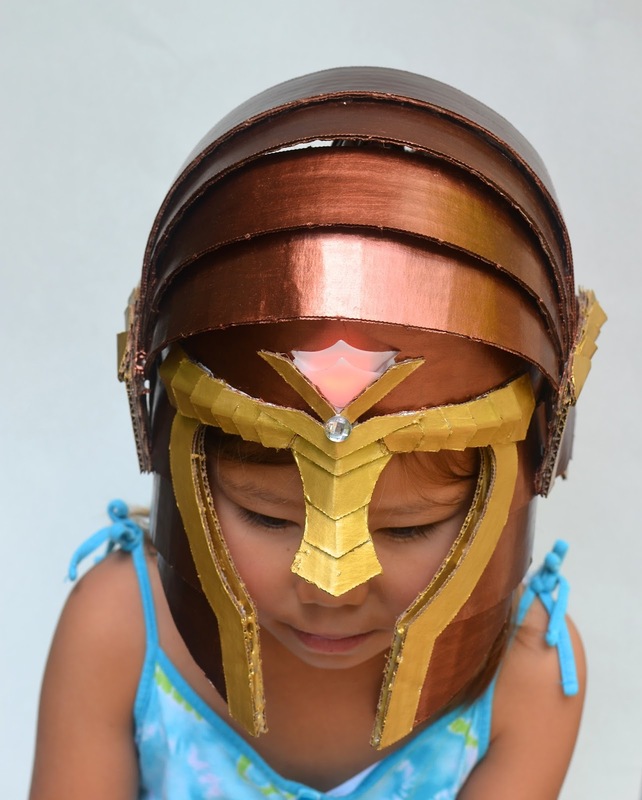 The helmets are designed to fit a 21" (or smaller) head. 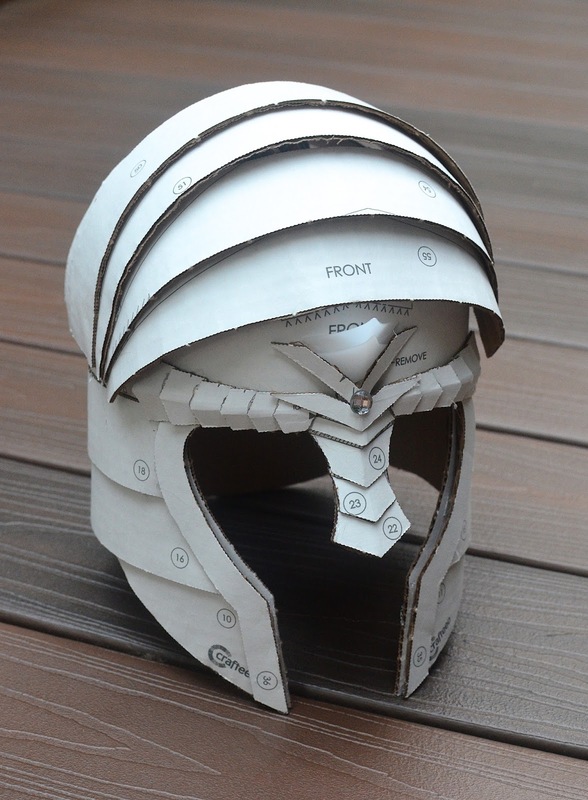 The kit comes with all the materials you need to make one helmet. 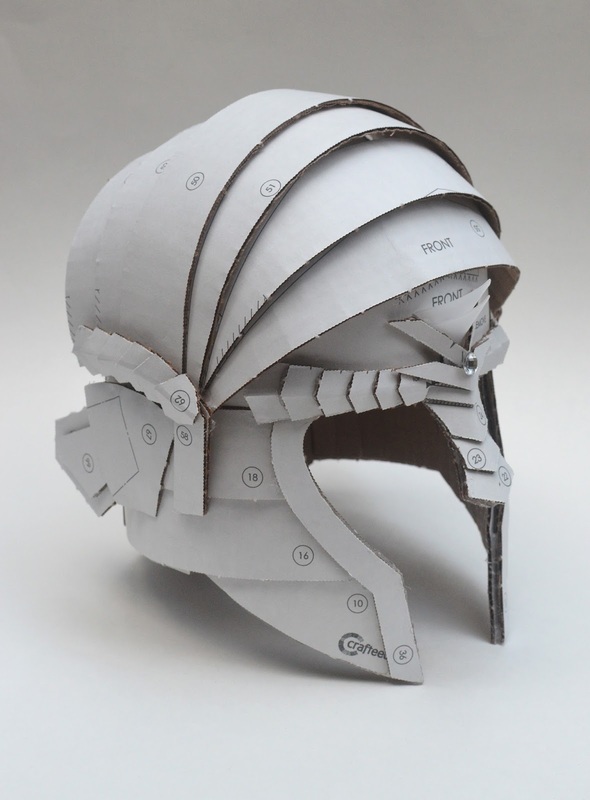 In our kit were four corrugated cardboard sheets of preprinted and precut helmet parts. 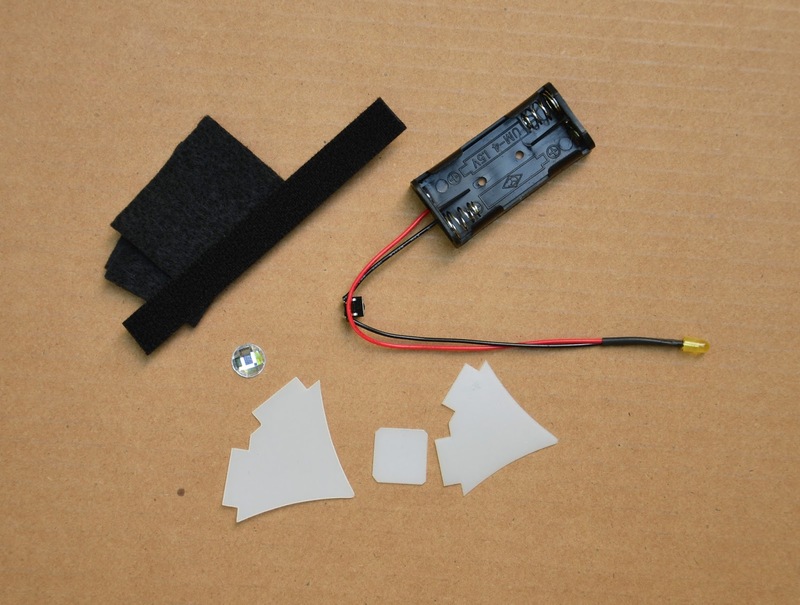 There were about 90 parts in total, including 3 plastic parts, 3 felt pieces and 1 soldered electronic circuit. 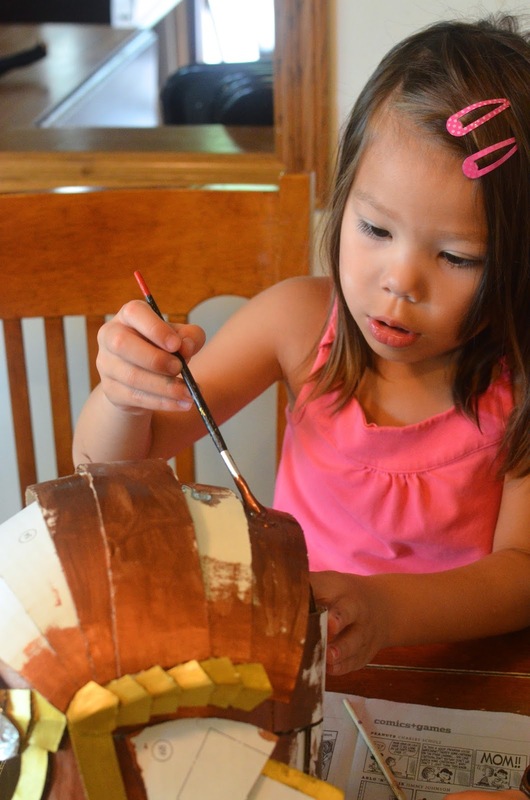 We provided a glue gun, glue sticks, a pencil, and some paint brushes. 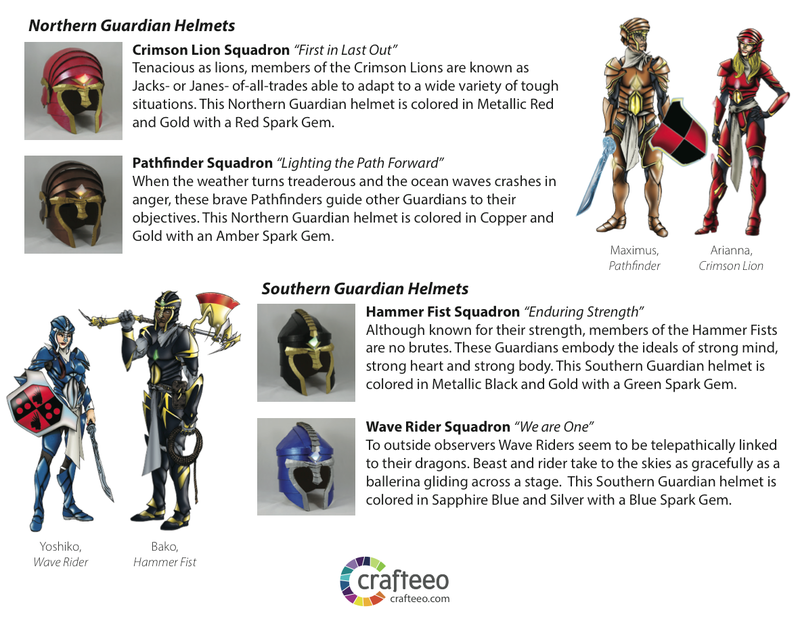 Each kit will make one helmet in one of the two designs - the rounder Northern Guardian and the more pointy Southern Guardian versions. Both designs have the same base structure (below the forehead) and a Northern Guardian/Southern Guardian variation in the crown. 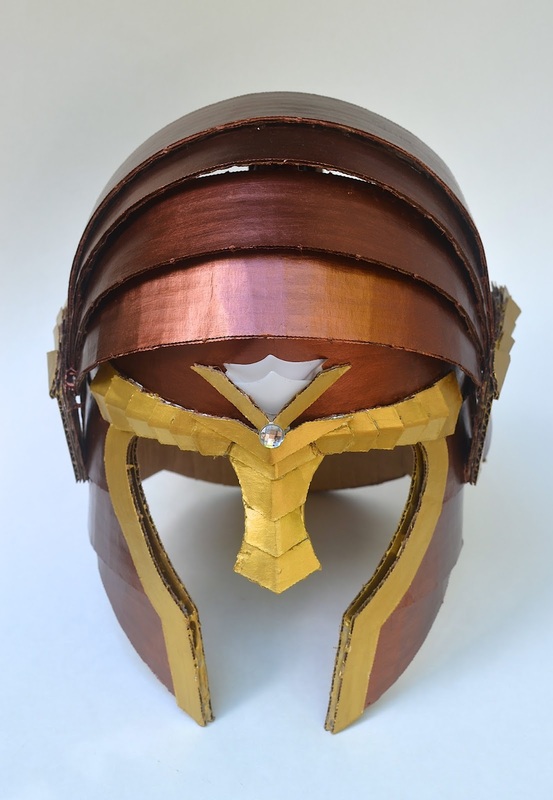 I'm estimating that it took us about 6-7 hours (spread out over three very leisurely evenings) and 6 regular-size hot glue sticks to make our helmet. 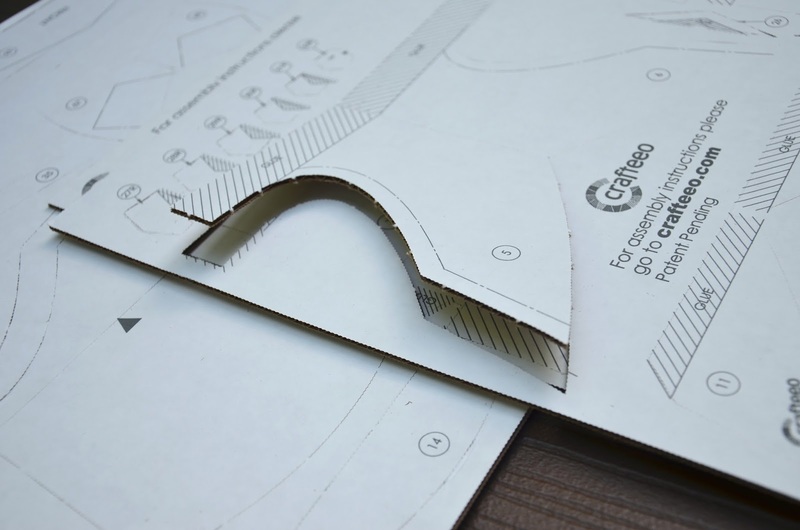 The pdf pattern comes with full-size templates to glue onto your own cardboard material. The document is US Letter size (8.5" x 11"). 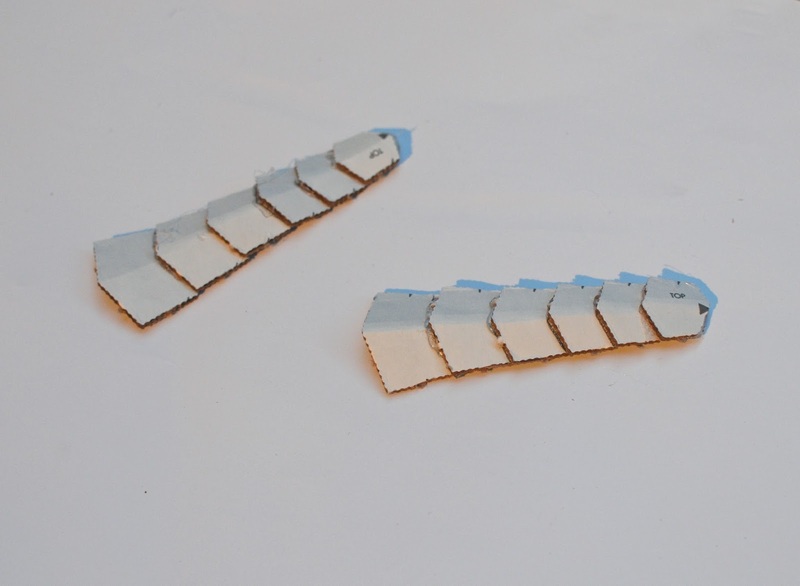 A few of the template pieces required assembly with tape (or glue) - these were the rectangular strips that had to go around the head and were too long to be printed whole on letter-size paper. The instructions for both the kit and the pdf pattern are entirely on video (there were no printed instructions in our kit) which can be found on the Crafteeo website here and here. Each video clip is about 1-3 minutes and is silent and annotated. 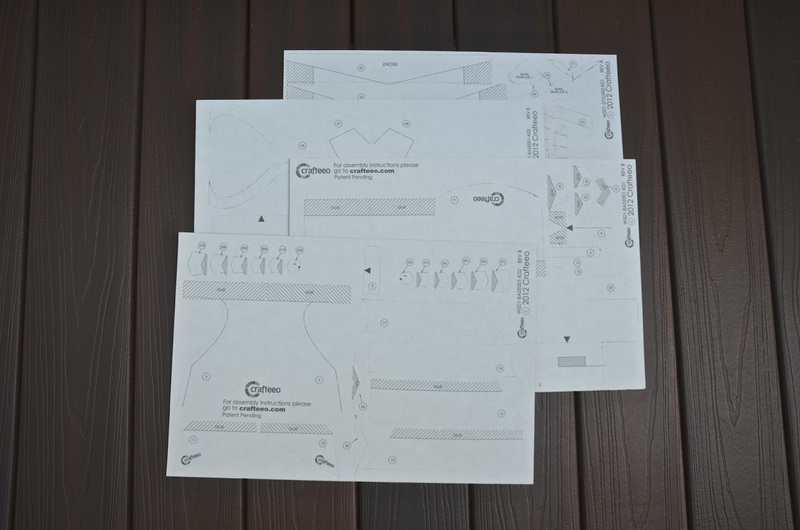 We found them to be excellent, clear, easy to follow and a superior alternative to printed diagrams or photographs. 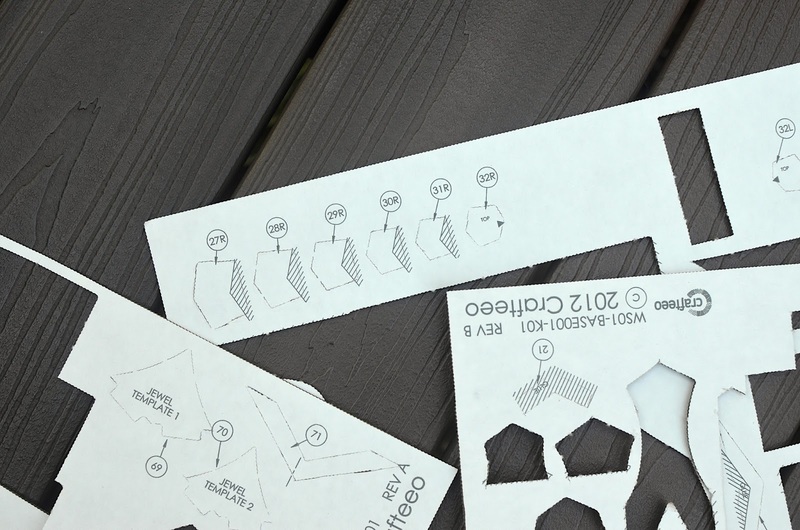 If you buy the pdf pattern, you will need to provide your own cardboard (doesn't have to be white). 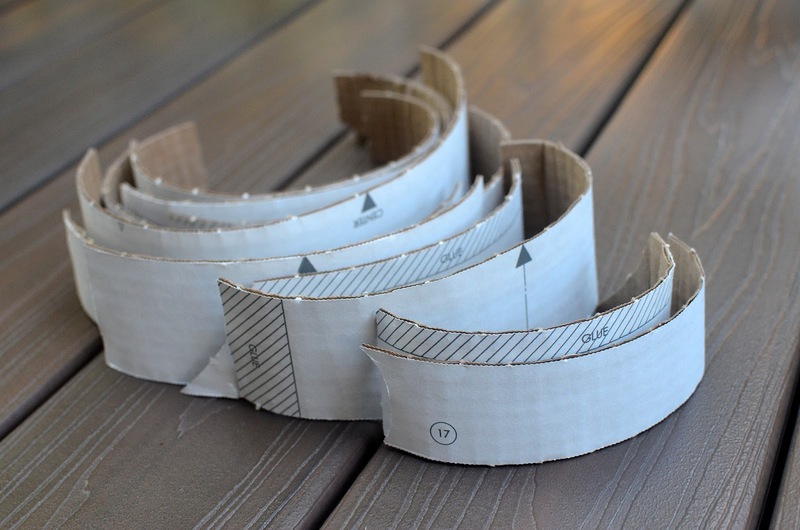 Pick single-wall corrugated cardboard that's similar to or just a little lighter-weight than typical amazon shipping boxes. 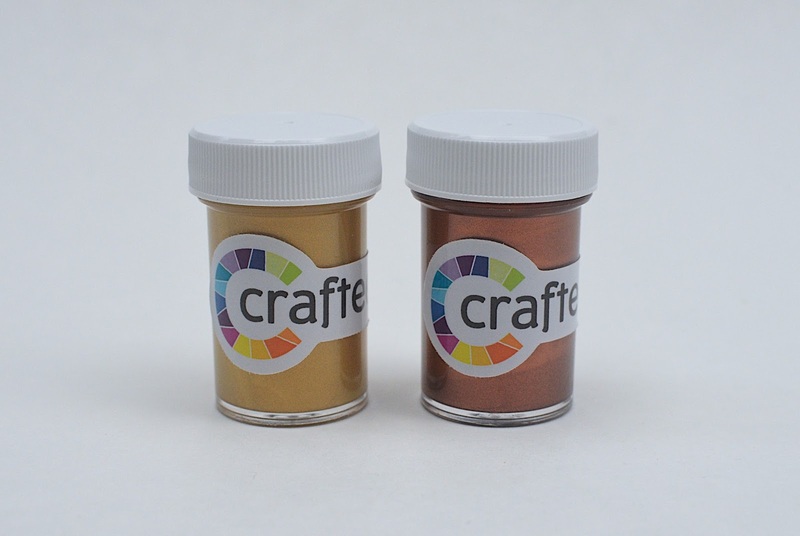 Find everything on the Crafteeo shop page. 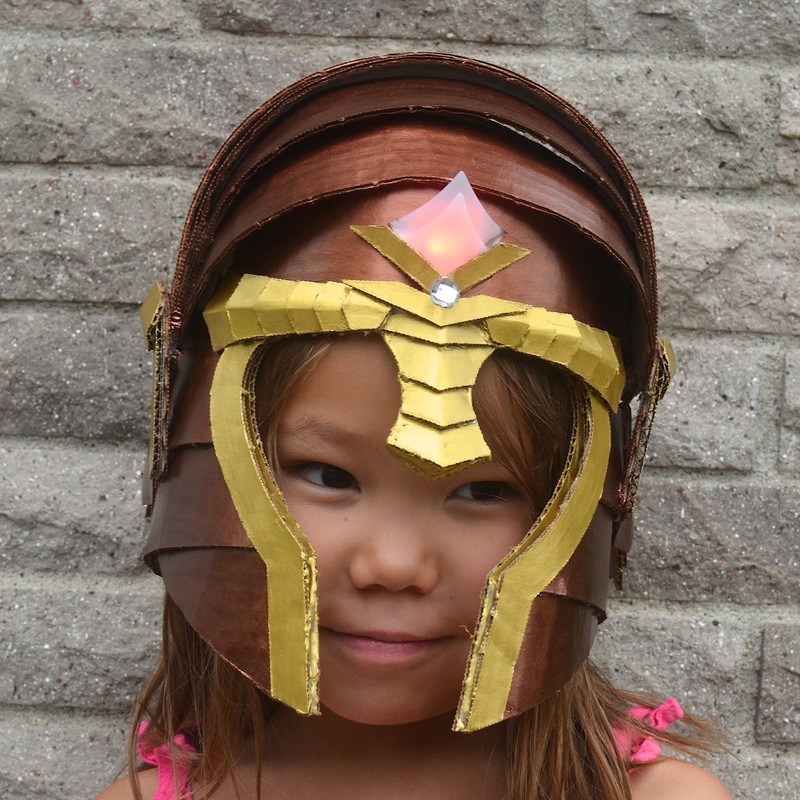 The helmet kits are $24.99 each. They ship domestically as well as internationally. The shipping costs are calculated at the checkout. 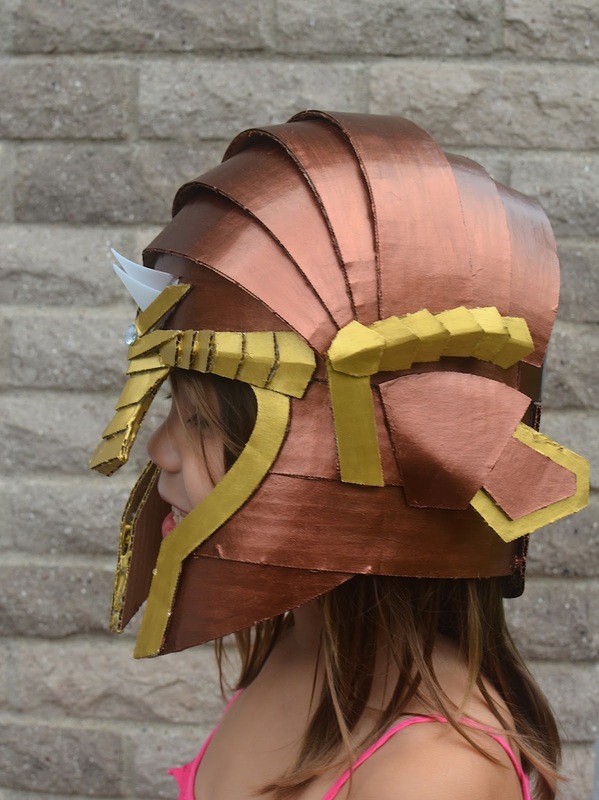 The pdf patterns alone are $7.99, which you can download to your computer, print out and use over and over again to make as many helmets as you need for your own personal kid-battalions. You can also buy the pdf pattern+electronic kit+ paint bundle for $14.99. In other words, everything but the cardboard itself. 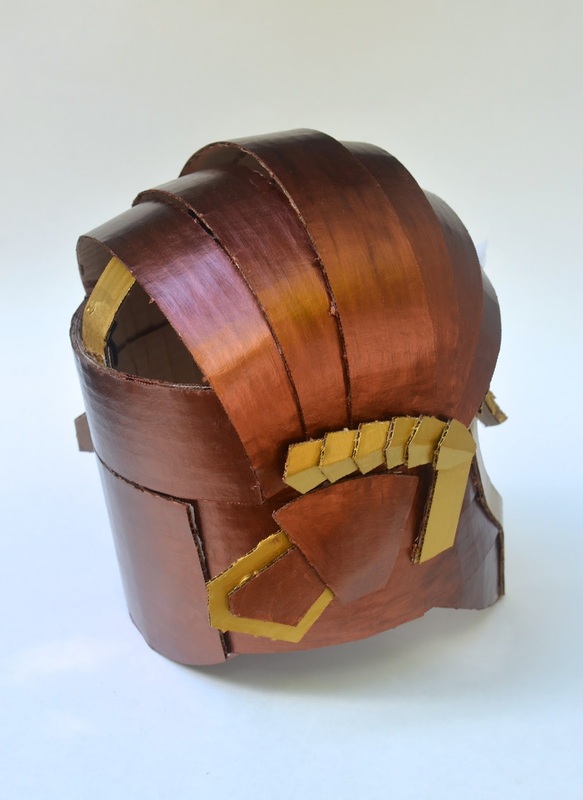 This way, if you want to build multiple helmets but need a little help with the electronics, (the circuit diagram and shopping list for electronic parts are included in the pdf pattern), you'll have a complete, soldered circuit to work with and/or for a sample with which to make more later. Crafteeo is offering a lovely discount for ikatbag readers! Enter the code ikathk2013 at the checkout to get $5 off EACH helmet kit you buy. That's $5 off one helmet kit, $10 off two, $15 off three, and so on. The code is valid till 31 Dec 2013.
to be notified of upcoming products, promotions, and new content as they expand the world of the Aeragos Guardians. 2 Come back here and log in to the rafflecopter widget below, telling us you've signed up for the email list. The giveaway will run for ONE week, till midnight of Sunday 22 Sept, and I'll randomly pick 5 winners first thing on Monday morning. 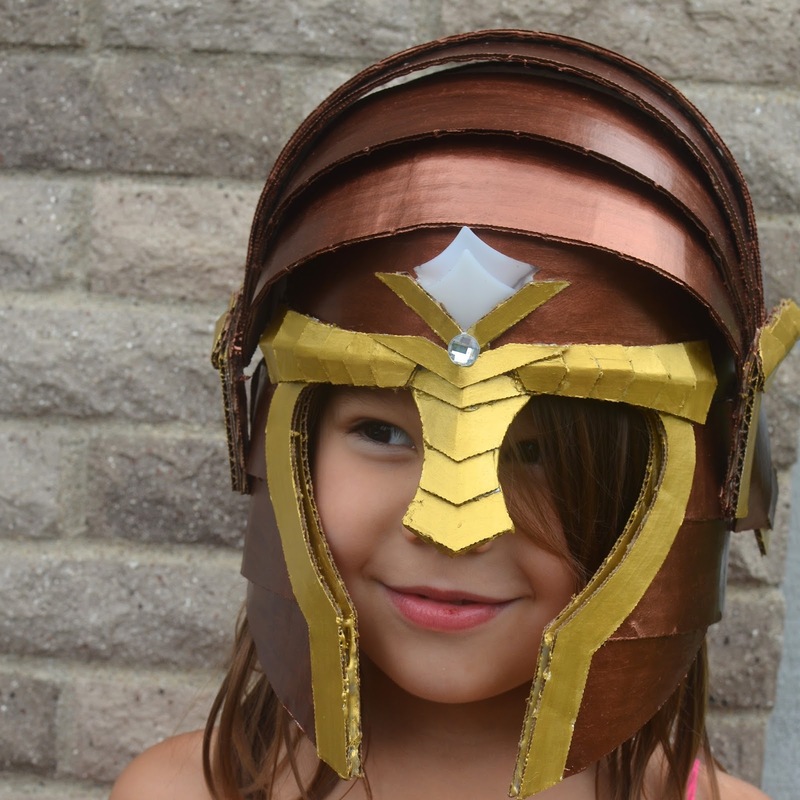 The winners get to choose which of the four helmet kits they want (you can tell us when we contact you). Good luck! 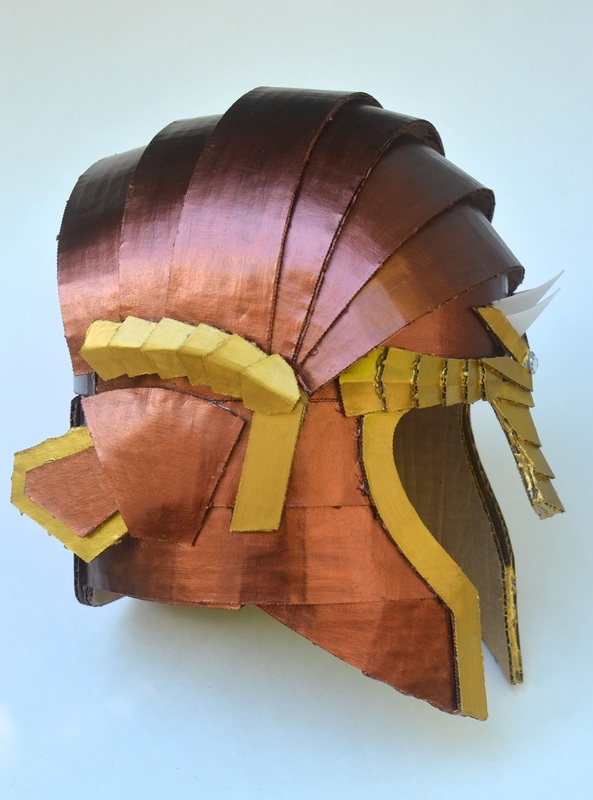 One more fabulous cardboard project, just in time for Halloween! I'm constantly wondering what you would make with the cardboard I unpack things from at work! I signed up - by the time they release the shields etc my oldest should be big enough to join in. My sons are enamored with this design! We would pick the copper colored one. like the light up feature..so cool!! Hammerfist for sure! My kids would love this. very cool! My kids would LOVE this. I love how they sell PDF's too! I love the light up front too! So cool! my boys will love it! I like the Wave Rider Squadron Helmet! OMG, so cool! This calls for a craft party! Thank you for the give away. My five year old grandson lives in a world of imagination and would love this! I joined their e mail and signed up through Rafflecopter. I hope I win one! How cool! Those helmets are really neat. I would have to check with my "helper" but I'm guessing we would get the Crimson Lion helmet kit, based purely on the fact that it's color is closest to pink. ;) They are all amazing and the light-up factor just shoots the coolness factor through the roof! :) Thanks for the chance to win! 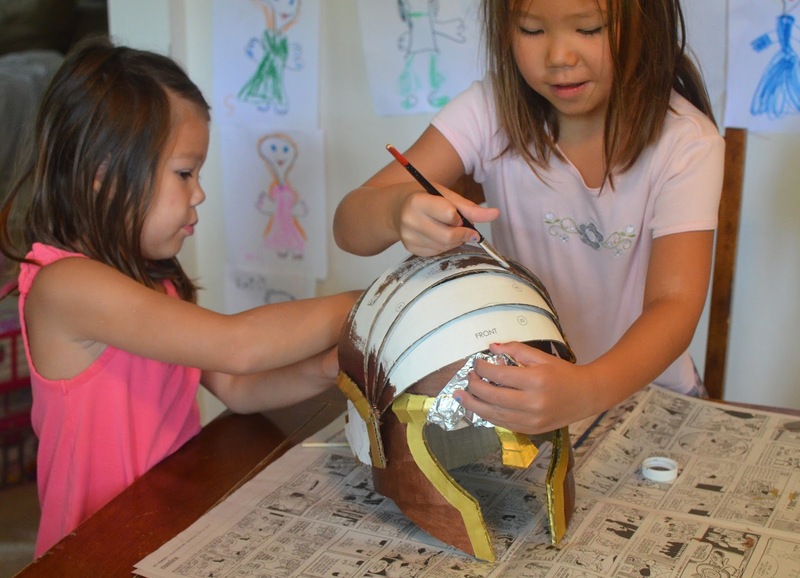 I have girls, but helmet-making (or any crafts) is welcomed in our home. 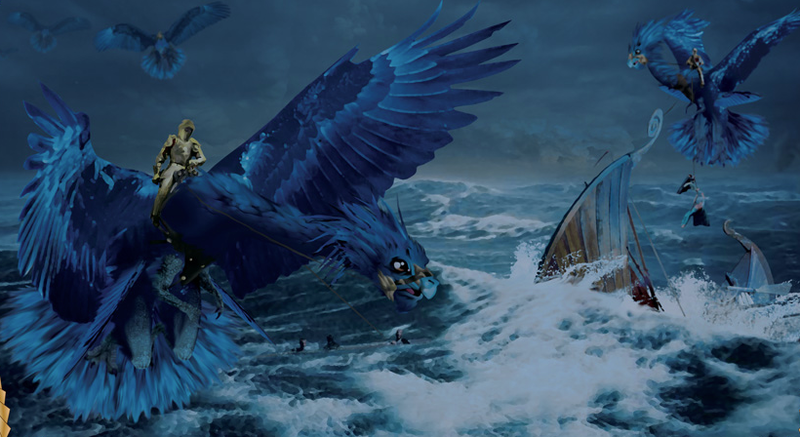 Wave Rider Squadron, pleasee..
cool...the offer period is until 31 Dec 2103? I have signed up.. both my children would love this! My 5yo son would love any of these, but I think he would pick the Hammer Fist hat. Thanks for the detailed review. Would love to do this with my nephew - I think he will love the pathfinder squadron. I have signed up. Thanks for the chance ! I have signed up - both my boys would love all of these - Ibut I think the Crimson lion one would be their favourite. Thank you for the give away. 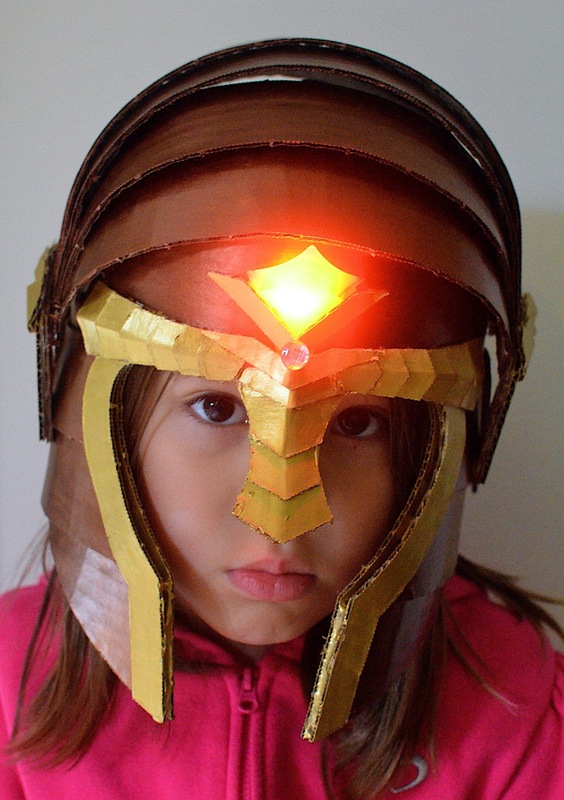 My niece would love this helmet! My childcare kids love it. How cool is that? My son loves helmets. He is probably too big for them but maybe I will order one and use it for a template. Thanks for the post! Easily the coolest kit I've ever seen! Maybe this will inspire our Halloween costume into fruition. The wave rider! Chiefly because of the colour :) I've subscribed with my hotmail address - hope thats ok.
And now my comment has been gobbled up, I think. The wave rider one please, and I used my hotmail address for signing up: will that make a difference? So awesome. What a neat project kit! !